By supernatural prayer I mean the infused, loving contemplation of God which God bestows upon the soul as a grace through an experimental knowledge of His presence, although there are many levels of this contemplative union with God. This is a grace that, strictly speaking, cannot be merited, but we can prepare for it through the practice of virtue, a profound sacramental life, the practice of prayer, and acceptance of the passive purifications God sends to us in order to rid us of the many defects we cannot overcome by our own effort. These few words do not do justice to the profound purification a soul goes through before God grants the grace of supernatural prayer. Still, all those in sanctifying grace are called to this lofty state. One particular prayer that helps to prepare us for the gift of supernatural prayer is the Prayer of Simplicity. To that end, let us first review the various stages of prayer in their proper – or at least conceptual – order. “These grades [of prayer] are (1) vocal prayer, (2) meditation, (3) affective prayer, (4) prayer of simplicity, (5) infused contemplation, (6) prayer of quiet, (7) prayer of union, (8) prayer of conforming union, and (9) prayer of transforming union. The first four grades belong to the predominantly ascetical stage of the spiritual life; the remaining five grades are infused [supernatural] prayer and belong to the mystical phase of the spiritual life” (Father Jordan Aumann, O.P.). So you see from the list above that the prayer of simplicity is the last level of ordinary prayer just prior to the beginning of supernatural prayer which begins in number five above under the name of infused contemplation. The very beginning of supernatural prayer normally involves faint touches of the infused contemplation of God – which is nevertheless a true and experimental knowledge of God. The prayer of simplicity, being a prayer of active, interior recollection helps to prepare us for this transition from ascetical prayer to infused prayer, should God be disposed to grant it to us. Sometimes when I drive on a long trip with my wife we engage in long and productive conversations. At other times during such trips, for example when she is reading a book and I’m driving, I will simply glance over at her, and her back at me, and we both know that all is well between us and nothing more needs to be said. In like manner, the prayer of simplicity is a movement from long meditations about God to a simple glance upon Him. This is fundamentally why it is called the prayer of simplicity. “The true devout man is a man of prayer, whose sole delight is to be with God, and to speak with Him, and who scarcely ever loses his sense of the presence of God. Not that he is always thinking of God for that is impossible here below but because he is always united to God in his heart, and is guided in everything by His Spirit. To pray, he has no need of a book, or of a method, or of great efforts of the head or even of the will. He has only to retire quietly into himself; there he finds God, there he finds peace, sometimes a peace full of joy, sometimes a peace in spite of dryness, but always a deep and real peace. He prefers the prayer in which he gives much to God, and in which he suffers, the prayer in which self-love is undermined gradually, until it can find nothing to feed upon; in short, a simple prayer, denuded of all images or of perceptible feelings, and of all those things which the soul can remark or experience in other kinds of prayer” (from Manual For Interior Souls). “In proportion as the soul grows, the acts of humility, faith, hope… tend, under the influence of the Holy Ghost, to fuse in a gaze of ardent love. Hence a simple method, useful at the beginning, should gradually give place to docility to the Holy Ghost, who breathes where He will. 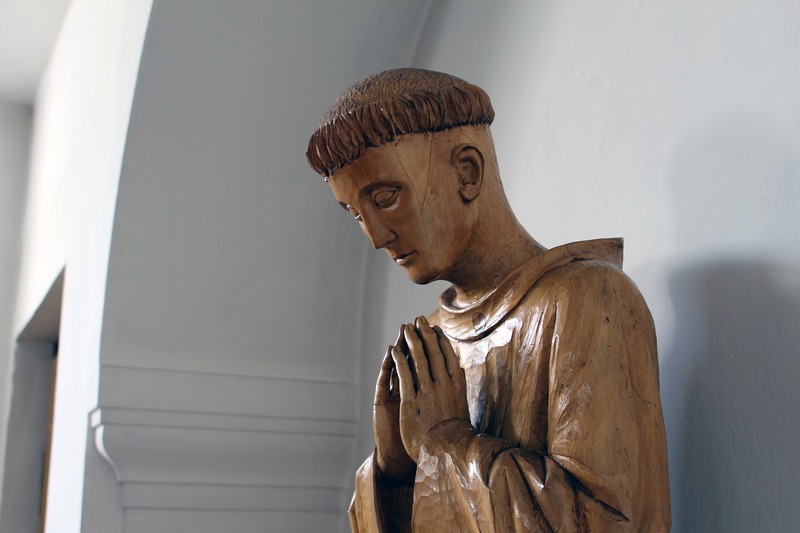 Prayer thus tends to become a prolonged spiritual communion, as the peasant of Ars, whom we quoted above, defined it: ‘I look at our Lord, and He looks at me.’ The prayerful soul says much in a few words, which he often says over and over without ever repeating himself. This prolonged spiritual communion is like the breathing of the soul or its repose in God; by faith and hope it breathes in the truth and goodness of God, and it breathes out love. What the soul receives from God under the form of ever new graces, it gives back to Him under the form of adoration and love. Consequently, to ask for the grace of Christian contemplation is to ask that the bandage of pride, which still covers the eyes of the spirit, may fall away completely in order that we may be able truly to penetrate and taste the great mysteries of salvation: that of the sacrifice of the cross perpetuated by the Mass, that of the sacrament of the Eucharist, the food of our soul. 1.”We must accustom ourselves to nourish our souls with a simple and loving look at God and at Jesus Christ our Lord. To do this we must withdraw our souls gently from all reasoning, from all arguments, and from a multiplicity of affections, to keep them in simplicity, respect, and attention, and thus to draw nearer and nearer to God, our only Sovereign Good, our first beginning and our last end. 2. Meditation is very good in its proper time, and very useful in the beginning of the spiritual life. But we must not stop there, since the soul, by her fidelity to mortification and recollection, generally receives the gift of a purer and higher state of prayer, which we may call the prayer of simplicity, because it consists of one simple look of ours, one loving attention on our part, towards God (in His Infinite perfections) or Jesus Christ (in some of his mysteries). 3. The soul, then, leaving all reasoning, makes us of a sweet contemplation, which keeps her in peace, attentive and susceptible to all the Divine operations and impressions which the Holy Spirit communicates to her. She does little, and receives much; her labor is sweet, and nevertheless it is very fruitful; and as she now approaches nearer to the Source of all light, of all grace, and of all virtue, blessings also increase in her more and more. 4. The practice of this kind of prayer must begin by our making an act of faith in the presence of God. After this, we need not try to produce several other dispositions, but we may remain simply and peacefully attentive to the presence of God, knowing that his Divine looks are fixed upon us, and continuing this devout attention as long as the Lord gives us the grace to do so; for this prayer is a prayer with God alone, so that the less the creature labors the more powefully God works in her. And since the work of God is always a rest and a deep peace, the soul becomes in this kind of prayer in a manner like unto Him, and receives also most wonderful effects from His Divine Goodness. 5. The soul might imagine at first she is loosing a great deal by omitting all these acts, but experience will teach her that, on the contrary, she is gaining very much, because the greater her knowledge of God is, the purer will be her love. Regarding this prayer of simplicity, Rev. Dom Vitalis Lehodey states: “This prayer got its clear and expressive name from Bossuet. When it has reached its more simplified form, others call it the prayer of simple look [or] active recollection. This simple look is always accompanied with love – a love, it may be, almost imperceptible or all on fire, calm or impetuous, bitter or savoury. This love is even that which is the chief thing of contemplation. Thus the soul, ceasing ‘to meditate – that is, to produce acts by dint of reasoning,’ thinks simply on God ‘by an attention, loving, simple, and fixed solely upon its object, almost like that of one who opens his eyes to give a loving look’ ” (The Way of Mental Prayer, pages 191-195, quoting St. John of the Cross, as edited). Practicing the prayer of simplicity is hardly an invitation to abandon other forms of prayer, although by such practice our vocal prayers may become more interior, our meditations more simplified, our Rosary paused during a mystery simply to unite ourselves to Jesus in that mystery, and our liturgical prayer made in closer union with God. But the real purpose of practicing the prayer of simplicity is to draw closer to God – not so much through knowledge about God but to God Himself by an inward gaze of loving contemplation. In this prayer of simplicity we stand in awe of the God who resides within our soul, loving Him, and resting in His incomprehensible and amazing presence. “The soul does little, but receives much” – because it is so close to the Source of all goodness, whose love is transformative like no other. References: The quotes from Father Garrigou-Lagrange are from The Three Ages of the Interior Life. The full essay of Bossuet is an appendix in Father Grou’s masterpiece, Manual For Interior Souls.